To file for divorce in Oregon, at least one spouse must have lived in the state of Oregon for the 6 months prior to filing the divorce. However, if you were married in Oregon, you can file for divorce there as long as one spouse is living there now, regardless of how long he or she has been living there. The no fault grounds for divorce in Oregon is that irreconcilable differences between the parties have caused the irremediable breakdown of the marriage. Review and Sign the Joint Petition for Dissolution of Marriage and related forms. File the documents with the Circuit Court Clerk (only one spouse needs to be present when filing). The Judge reviews and signs the Judgment of Divorce and mails a signed copy to each spouse. Your divorce is then complete. 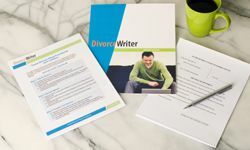 DivorceWriter provides forms specific to the state of Oregon and offers a money back guarantee if your documents are not accepted by the Court. You have qualified to use DivorceWriter to complete your Oregon divorce papers online. Select "Continue" to start the interview.